This is today's second post. But Linda just sent this photo to me and I know you will want to see it immediately. Look at this fabulous fabric!!! No color removal needed here. Love the lining paper too. "Thursday I went out to a fabulous local art supply store to look for paper to line my boxes. 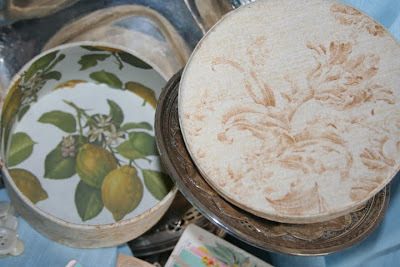 I found some delightful Italian papers and selected one with lemons for my first box. I love the fabric. Here is the surprise; the fabric is just as it came off the bolt. When I saw it last year, I got a half yard because I knew that I would find something special to do with it. I would have preferred paper with a design of vines and/or plants more similar to that in the fabric; but what can I say? The colors do harmonize. This box was my first and is a trial run for second one that will be a gift. I cannot tell you how pleased I am with it even though my critical eye says there are obvious flaws. I hope that subsequent boxes will have fewer flaws. Thank-you so very much for teaching us how to cover boxes with fabric and line them. Many years ago, I bought some boxes because I wanted to cover them with wallpaper. I had attended a Spirit of Cross Stitch Festival in Des Moines where I took a workshop class featuring a stitched design to put on the top of a wallpaper covered box. I wanted to make more wallpaper covered boxes but the wallpaper was too heavy to work well. I reluctantly put the boxes away and gave up on the idea. Now....continue to scroll down and see Jean's Sewing box too. Beautiful work, Linda. Love the pear paper! That is yummy looking paper! I love the covered boxes. I made one a few weeks ago, but the instructions I followed were not nearly as good as yours, and mine was painted inside, not paper covered. Yours are so much nicer, being 'finished'. I can't wait to make some! Question for you...do you use the paper boxes or wooden ones? Do you think it would work to paint an older wooden one that might have writing on it and then go ahead an make it according to your instructions? The boxes are wonderful, they both did a beautiful job. I was thinking about that when you mentioned paper, the craft stores have wonderful papers in all types of prints for scrap booking. Hi Alma: I love your tutorial on covering boxes. Lurking in storage I have a huge roughly made cheese box that I was thinking of painting this winter - the wood would need a lot of sanding and I would need to put some filler in cracks, but do you think your technique would work with it? Just found your blog and I love your box. One question...you mentioned color removal. I have not seen this technique. I would love to know more about this. Thanks for the covered box tutorial! I am going to make some for Christmas gifts. I have some *smalls* that would be cute mounted on top of the lids. A while back you mentioned some Chenille Trim that you dyed and used around the edges of a piece. Could you please tell us again where you got it? I checked out the website at that time, and it wasn't listed. Thanks again..cj! The ones used in this demonstration were paper mache. I haven't covered a wooden box yet so I can't answer that question. I would experiment with a smaller one that isn't so dear to you first. The PVA glue from Paper Source works on wood also. I love the old cheese boxes. It would take quite a bit of sanding to get one of those primed. I might try painting your box and adding a stencil. Check the posting of Oct. 26th. It gives quite a bit of information about color removal. It's one of my favorite ways to spend an hour or two! Thanks for sharing I would love to know more about this.